It’s a mystery picture directed by John Farrow, who was Mia Farrow’s father, and is, I think, a very underrated director - a real stylist and a fan of long takes. 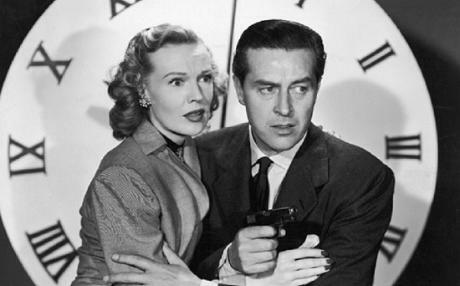 The plot of The Big Clock has Ray Milland looking for a murderer. He has been framed for a murder himself. It’s set in the publishing world—there was a remake called No Way Out which was set in the Washington world and did a pretty good job of approximating the whole story until they got to the ending, where they completely blew it. But one of the great things about The Big Clock is Charles Laughton as the villain. He is covering up the murder that he committed by searching for this other figure, who happens to actually be Ray Milland, who was on the scene at the time. It's one of those Paramount pictures from the late ‘40s where there’s a lot of matte work, a lot of miniatures, and some amazingly fluid camera work of the offices, where the camera just floats from one office to another because the sets have all been designed so the doors have no walls on the other side. So instead of having to cut scenes into pieces, the whole thing can play for minutes at a time. It's not something that’s noticeable on first viewing, but it’s one of the things that draws you into the story. Luckily the script is really clever and even skirts on screwball comedy at times. It's a very rewarding movie and a lot of fun. I like a lot of John Farrow’s things—I like the follow up to this one, which is Alias Nick Beal, where Ray Milland plays the Devil, basically. Made pretty much by the same group and around the same time—but I won’t count that as an extra one!